The 2017 Honda Fit has won over drivers from all across Goshen and Monroe thanks to its flexible interior, character-driven looks, and engaging drive. You’ll be able to take advantage of such standout benefits across all trim levels, but features and amenities will naturally differ a little between them. If you’re not sure which model will best suit your needs, just get started by taking a look at our quick and easy overview. Multi-Angle Rearview Camera: Unlike most rearview camera systems, this one can provide three separate viewing modes (Normal, Wide, and Top down), so you’ll benefit from a comprehensive view of the area behind you as you reverse. 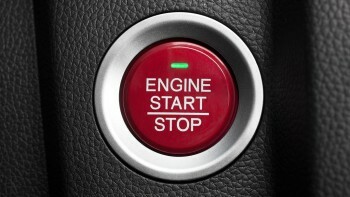 Keyless Entry: Hate having to root around in your pocket or purse in order to find your car keys? With the Fit, you just won’t have to; as long as the Smart Key is about your person, the doors will unlock at a touch of the handle. Honda LaneWatch: This innovative system uses a small camera mounted below the passenger-side mirror to provide a video feed of the road that reveals close to four times more than the mirror alone. 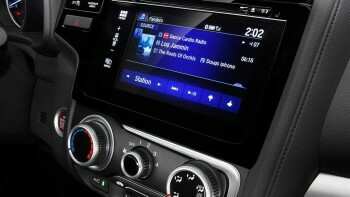 7-inch Display Touchscreen: You’ll find it effortless to control everything from Bluetooth calls to your current music selection on this high-resolution touchscreen, which reads pinches and swipes in addition to traditional movements. Leather-Trimmed Seats: Luxuriate into deeply supportive leather seats to provide a first-class atmosphere during each and every ride. Heated Front Seats: Choose between two separate heat settings to ensure that both you and your front-passenger remain toasty-warm through colder weather. Satellite-Linked Navigation System: Receive turn-by-turn directions to any address in the United States, plus Honda HD Digital Traffic and free map updates for 5 years. The 2017 Honda Fit has stolen the spotlight from many a rival hatchback, and you can have yours any way you want it. To find out more about each trim level, or to arrange a test drive, don’t hesitate to come on down to Middletown Honda today.